When a force is applied on a liquid medium contained in a confined space, the pressure of the liquid increases. This increase in pressure of the liquid is proportional to the applied force. Hence a measure of the increase in pressure of the liquid becomes a measure of the applied force when calibrated. A piston with a loading platform (as shown in figure) placed on top of the diaphragm. A liquid medium which is under a pre-loaded pressure is on the other side of the diaphragm. A pressure gauge (bourdon tube type) connected to the liquid medium. The force to be measured is applied to the piston. The appilied force moves the piston downwards and deflects the diaphragm and this deflection of the diaphragm increases the pressure in the liquid medium (oil). This increase in pressure of the liquid medium is proportional to the applied force. The increase in pressure is measured by the pressure gauge which is connected to the liquid medium. The pressure is calibrated in force units and hence the indication in the pressure gauge becomes a measure of the force applied on the piston. 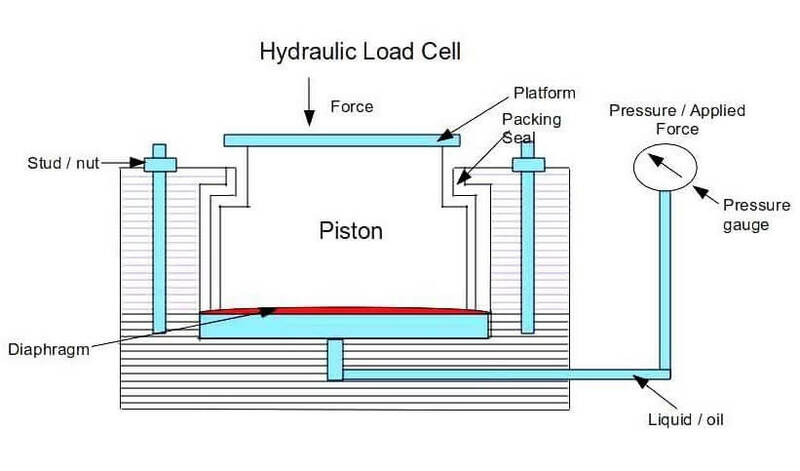 As the hydraulic load cell is sensitive to pressure changes, the load cell should be adjusted to zero setting before using it to measure force. The resolution is about 0.02 percent.